BRAOU B.Ed 1st year Annual Exam Dates 2019: Dr.Brambedkar Open University has uploaded the B.Ed (Bachelor of Education) first year Annual ExamTable 2018 @ the official website braou.ac. in the. The candidates who are studying the B.Ed courses at the Dr.B.R.Ambedkar Open University now check the examination dates / times table from the official website or from the table below. Dr.B.R.Ambedkar Open University B.Ed I Year Annual Examination Time Table 2018the B.Ed. 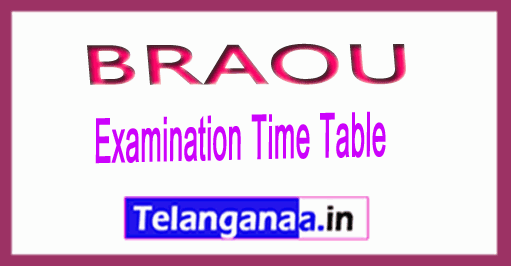 I Year Theory examinations by Dr. B.R. Ambedkar Open University are scheduled from 28-12-2019 to 04-01-2019 for students who are approved in 2019-20 batch. Students are advised to download the examination forms from the University website www.braou.ac.in or www.braouonline.in. Students who meet the requirements for participation during the workshop are only entitled to the I YY theory examinations. The payment of the examination fee and the submission of the applications for examination begins on 24-11-2018. The completed examination registration forms together with the prescribed fee paid by a Demand Draft from any branch of the State Bank of Hyderabad / Andhra Bank / State Bank of India, in favor of the "Registrar, Dr BR Ambedkar Open University, Hyderabad" together with xerox Copy of the ID card should be submitted to the Program Centers on or before 06-12-2018.